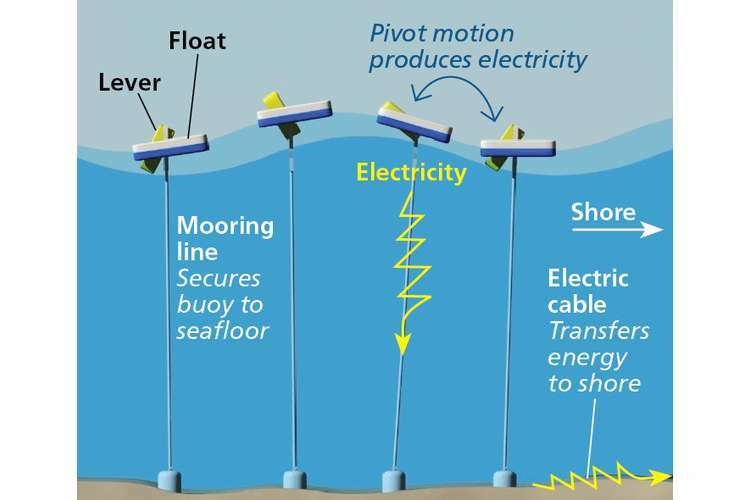 Marine energy focuses on wave and tidal energy. Marine energy challenge has been associated with the wave and tidal stream energy. The wave energy occurs in the water movements nearby the surface of the sea. The waves are formulated through the blowing winds over the sea, thereby the water acts as a carrier of energy. The intensity of energy is dependent upon their height and period. Similarly, the tidal energy is the result of the rise and fall of tides. The amount of energy which can be extracted is dependent upon the velocity of the flowing stream and the area diverted (Zhang, 2012). There is a huge potential of the water and tidal stream energy to supply the electricity in bulk all over the world. Wave energy is an emergent technology as an alternative renewable human resource of energy. In this context, there are more than 200 wave energy mechanisms in their various stages of demonstration and testing. So, the aims of this study are to analyze the challenges and opportunities in the research and development of the renewable sources of marine energy. It also aims to find out the size of wave and tidal energy resources, the status of technological development and the probable economic prize to the organizations implementing it with the help of various statistical and experimental methods and evaluation of the results regarding the same (CSIRO, 2018). With the help of a team of experts comprising of oceanographers, engineers and economists, a review was conducted regarding the Australian resources, cost projections, uptake and impact of extraction of energy. The Australian Wave Energy Atlas provided a 4D interactive wave map of the greater Australian Coastal area which was relative to the infrastructure and spatial constraints such as shipping routes, ports, aquaculture and marine parks (Turcios and Papenbrock, 2014). The aim was to analyze the part of the marine energy in the future energy mix of Australia by 2050. The findings were that the southern Australian coastline had a great scope of wave resources as the oceanic winds from the southern side constantly generate large waves which travel from the northern direction towards the southern coastline. It provides ideal conditions for the production of wave energy. The numerical model of simulation was also undertaken to analyze and verify SNL-SWAN wave model –the phase-averaged spectral wave model which is being used by the international community for simulating the effects of wave energy converters on the surrounding wave fields (Moldan, Janoušková and Hák, 2012). SNL-SWAN Simulated attenuation of significant wave height in the lee of the array of CETO WECs (represented by circles) at the Garden Island site. Triangles represent measurement sites in the field program. The assessment of the wave energy resources was revised in the context of prior estimates of resources which did not capture the spatial distribution of the resources of Australia. The total available wave energy in Australia is an order of magnitude, is larger than 248 TW h electricity. It was generated in Australia in the year 2013-2014. It further indicates that the magnitude of wave resources does not restrict its future uptake. The flux of wave energy across the depths of 25, 50 and 200 m is projected to be 1796, 2652 and 2730 TW h/year respectively. The variability of the waves is also an important consideration for the extraction of wave energy. An analysis of the wave variability at the 25-m isobaths illustrates that the mid-latitude coastal region is favorable as it demonstrates the low variability of wave energy with respect to the total availability of wave energy (Commonwealth Scientific and Industrial Research Organization, 2017). The studies reflect that the southern coastline of Australia comprises a great wave resource. In the year 2005-2006, Australia had generated about 254 TW h/yr of electrical energy from the total capacity of 50GW. 75% of the electricity generation was from coal. The resources of wave energy along the southern coast of Australia which is 146 GW is three times the total installed capacity of the country (Devine-Wright, 2014). It has been found that 10% of the incident wave energy can satisfy around 1/2 of electricity needs of Australia. The nearshore wave energy resource map explains that the resource is approximately 30% -50% lesser as compared to the estimates of the World Energy Council for Southern Australia. In the area of Australian National Electricity Grid , the resource of wave energy is essentially spatially same (AORES, 2018). The data set out in the study focuses on providing a suitable data set for informing the policy with details of the wave energy which is available on the nearshore regions of knowledge management Australia for the purpose of harnessing the wave energy. The data shall further define the most appropriate locations for commercializing the wave energy converters. The user group shall require the data of wave energy time series which provides the details of the thresholds which a device would fail to operate. The Government of Australia is required to produce 45000GW h/ yr of additional renewable energy prior to 2020. The aggregate renewable energy quota can be accomplished if 10% of the energy which is available over a section of 100 km of the coast of Southern Australia is transformed into electricity (Eco generation, 2018). Furthermore, the limitations of this study pertain to the limitation of the knowledge of resources comprising of the temporal and spatial variability along with its spectral characteristics. The difficulty has also been confronted regarding the access of spatial data and identification of multiple designated marine management regimes of the marine territory of Australia. Lastly, there is also a limited evidence base and methods for the purpose of accessing the impacts of extraction of wave energy on the marine and coastal atmosphere (ARENA, n.d.). 1. AORES(2018) 2018 Australian Ocean Renewable Energy Symposium [online] Available from: https://aores2018.com.au/ [Accessed 26th September, 2018]. 2. ARENA (n.d.) Australian Wave Energy Atlas. [online] Available from: https://arena.gov.au/projects/australian-wave-energy-atlas/ [Accessed 26th September, 2018]. 3. Commonwealth Scientific and Industrial Research Organization( 2017) Wave Energy in Australia . [online] Available from: https://www.csiro.au/en/Research/OandA/Areas/Marine-technologies/Ocean-energy/Wave-energy [Accessed 26th September, 2018]. 4. CSIRO (2018) The Australian Wave Energy Atlas Project Overview and Final Report [online] Available from: https://arena.gov.au/assets/2014/02/Wave-Atlas-Final-Report.pdf [Accessed 26th September, 2018]. 5. Devine-Wright, P.(2014) Renewable Energy and the Public: from NIMBY to Participation. NY: Routledge. pp. 1-100. 6. Eco generation (2018) Australia’s wave energy inventors look for a break. Paragon Media Pty Ltd.
7. Moldan, B., Janoušková, S. and Hák, T.( 2012) How to understand and measure environmental sustainability: Indicators and targets. Ecological Indicators. 17, pp.4-13. 8. Moriarty, P. and Honnery, D.( 2012) What is the global business potential for renewable energy?. Renewable and Sustainable Energy Reviews. 16(1), pp.244-252. 9. Turcios, A.E. and Papenbrock, J. (2014) Sustainable treatment of aquaculture effluents—what can we learn from the past for the future?. Sustainability. 6(2), pp.836-856.